Roman “station lists” exist that tell us about the stations if you went from somewhere to somewhere. There are a number of these lists, but we don’t know why they were created or stored. He showed an image of the Vicarello Goblets. Then he showed ways to put these itineraries on a map or to visualize them in other ways like a topological map. A topological map can show closeness or betweeness. High betweeness is where you might get a bottleneck of travelers. He showed that the data for itineraries has been put into databases for others to look at like that of the Ancient World Mapping Center. When we look at them the beginnings and ends of itineraries are often strange. Leif commented that we need to be careful when drawing conclusions from small sets of data (like these lists) or combined data from different sets (and lists). We need to remember that the texts or lists are not the phenomenon. Access to texts is also changing rapidly. Leif showed a graph of the coordinate values that represented points in terms of time. Latitude is tied to length of longest day, but it isn’t even. You get an uneven grid. The coordinates of boundary locations seem to fall on the irregular time-based grid network. It is as if the edges of regions are meant to fall on the hours of the degree based system. It looks as if alignment was important to him – he seemed to have believed that alignment should be the case like grain in wood. Leif talked about how Ptolemy’s data can tell us things about his theory. He talked about the warp and weft of the data. It is also important to see how visual arguments help us understand numeric ones at scale. The visual projection shows us something about Ptolemy’s coordinates (numbers). Finally, Ptolemy is interested in mapping the world to the celestial which means he has to know the time. The Peutinger map was his third case study. 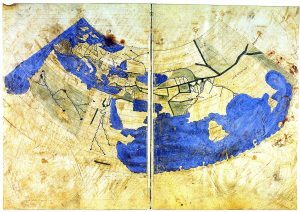 It is a copy of a map that we are fairly sure was produced in late antiquity. It is a weird parchment scroll that is long, but not high. Is it a guide for carrying on a trip? Rome is somewhere in the middle but not exactly in the middle which has led people like Richard Talbert in Rome’s World to argue that the long map was a presentation piece and Rome should be in the middle which means we are missing three parchments on one side. Leif runs a project called Pelagios Commons which allows him to compare locations in the map to those from other itineraries (lists). The itineraries on the coast lines of the map seem similar to another work. He argued in support of Talbert suggesting that the scroll may have been copied from a wall. This led to the general warning that the way that data is experienced and consumed is often very different now from how it was intended to be consumed and contextual evidence can come from other unexpected places. Contemporary datasets are just like the old ones. They are composites, each with a long and complex heritage. They are incomplete and degraded. They need to be read closely and distantly. They need to be challenged just as we would any other type of evidence or claim. He ended by saying that the point of the humanities is not to find answers so much as to question that answers we have been given. We need to rethink what we thought we knew and that includes visualizations.